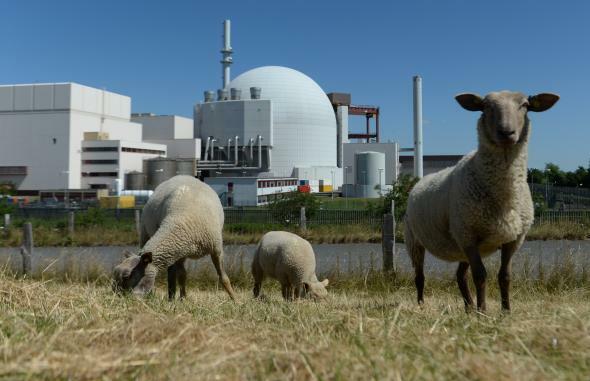 These sheep outside the nuclear power plant in Brokdorf, Germany, have grass power to fall back on. Germany, Europe’s largest energy consumer—and the world’s seventh-largest—seems to be running out of politically feasible sources of power. At a summit last week, EU leaders pledged to reduce their reliance on Russia for energy supplies. This isn’t an immediate crisis: No matter how tense things get, Russia isn’t likely to eliminate 14 percent of its export earnings by cutting off Europe’s energy supply. If Moscow decides to punish Ukraine by withholding gas supplies or raising prices, there are now alternate supply routes for getting the gas to Western Europe. And thanks to a milder-than-normal winter, gas reserves are currently high. But in the long term, countries like Germany would likely feel in a better position to deal with Russia if they weren’t dependent on it for one-third of their oil and natural gas. Unfortunately, none of the country’s other options looks that great either. Germany is one of the few countries in the world that seems to be sticking with its post-Fukushima pledge to wean itself off of nuclear energy. It plans to have all of its nine remaining nuclear plants offline by 2022. Germany is also in the midst of a push, known as the Energiewende, to have 80 percent of its energy supplied by renewable sources by 2050. * Unfortunately for that goal, the country’s once-booming solar energy industry has essentially collapsed over the last three years thanks to falling state subsidies and competition from cheaper Asian rivals. The EU has also opened an investigation into the country’s green energy subsidies, and a parliamentary commission recently recommended scrapping them entirely amid concerns about efficiency. Despite Angela Merkel’s government’s focus on green energy, the country’s coal use actually hit its highest level since 1990 last year. With no conventionally extractable natural gas on its own, some are also recommending that the government consider hydraulic fracturing in Germany, which the government currently opposes on environmental grounds. All of Merkel’s government’s goals—shifting to renewable energy, weaning the country off Russian gas, reducing the risk of nuclear accidents—have been admirable, but doing them all at once raises some questions about how exactly the country plans to keep the lights on in the medium-to-long term. It would be an unfortunate irony if coal and fracking ended up being the beneficiaries of Merkel’s green energy push. *Correction, March 24, 2014: This post originally misstated that Germany’s plan was to have 100 percent of its energy supplied by renewable sources by 2050.